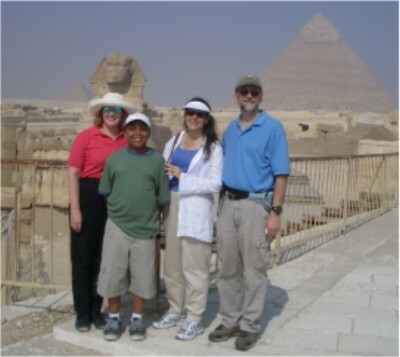 The four of us (Nancy, David, Curtis, and Trish) arrived in Cairo August 4, 2004 to begin our adventure. When David saw the position advertised at American University in Cairo, everyone was enthusiastic about the possibility of going to Egypt. For Nancy and Trish, it was a homecoming to their family's home of several years in the 1960's, and a return to Trish's alma mater at AUC. For David and Curtis, it was all new. Here you will find photos of our year in Egypt. An almost daily photo journal. Our apartment. First visit to the pyramids. Second visit to the pyramids of Giza. Our suburb, Maadi. Curtis' school, Cairo American College. Pictures of The American University in Cairo. The new AUC campus site. A felucca ride on the Nile. A tour of the Citadel. Tour around Cairo. Our holiday in Sharm El Sheikh. A walking tour of old Cairo. Luxury at Mena House. Visit to the Bahariya Oasis. Scenes from the White Desert. Visit to Abu Simbel. The Old Cataract Hotel in Aswan. Some sights around Aswan. The Temple of Philae. The temple at Komombo. The Temple of Horus at Edfu. The West Bank of Luxor. The Karnak Temple in Luxor. The Luxor Temple. Pictures from the Nile Cruise. Pyramids of Dahshur. Trip to Fayoum. Shopping in the Khan. Second visit to the White Desert. Interior of the Manial Palace. Views of Cairo from Roda Island. Short trip to Alexandria. Spring break in Greece! Two days in Athens. The Greek island of Hydra. Naxos Island. The spectacular Santorini. Our Camel Caravan. Baby Wash program. Vacation in Barcelona. Montserrat Monastery.